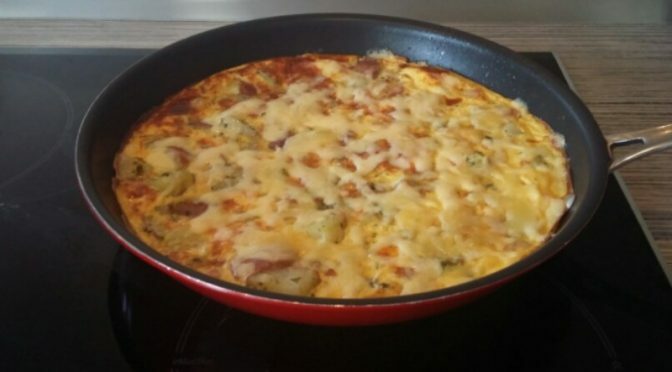 I love meals that can be made from ingredients that are always in my cupboard and frittata is one of my go to dinners. To make the preparation easier you can cook the veges earlier in the day, the night before or if you like to be really organised – plan your dinner the night before around having left over veges for the frittata. This recipe is very adaptable so quantities are a guide only and can easily be added to. If you get your veges and pour the eggs over and the eggs aren’t covering the veges just mix up some more egg and milk in a bowl and pour over. And it’s gluten free and can easily be made vegetarian. Heat a little butter and fry pan and cook bacon. Add veges and heat through a little. While veges are heating break eggs into a bowl and add about 1 tablespoon of milk per egg. Once you have made this a few times you can just pour the milk in but for the first few times if you aren’t confident at getting scrambled egg consistency its probably best to measure it. Turn your element down to low heat and pour in the eggs. Turn the grill on for the next step. When the frittata mixture starts bubbling put the frypan under the grill to cook the top . Not too close as you want it to cook not burn. Chop up bacon into smallish pieces and fry until cooked thru. 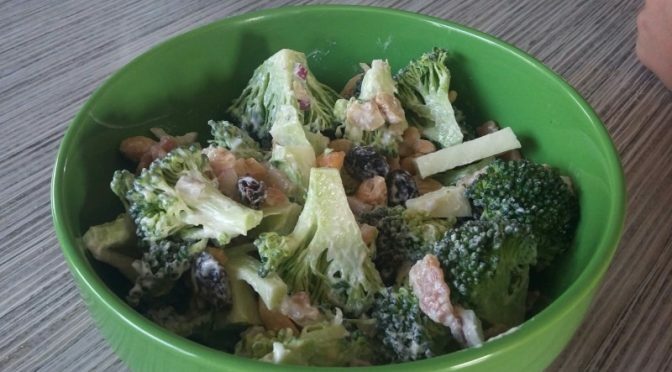 While the bacon is cooking cut up broccoli heads into small bite size pieces, place in a bowl. I don’t like wasting the stalk so I cut up into bite sized pieces and throw into the salad as well. Once bacon has cooled slightly place in the bowl with other ingredients. Add raisins, nuts, diced red onion put to the side. Mix sour cream, mayonnaise and a squirt of lemon juice together, mix well. I have started adding the cranberry, almond, cashew mix instead of the nuts and raisins. I don’t always have sour cream in the fridge so have been using greek style yoghurt instead. A couple of years ago my children started getting cold after cold ( and they are usually very healthy ). I decided they needed more vegetables and started adding broccoli to everything including adding pureed broccoli stalk to meat patties. 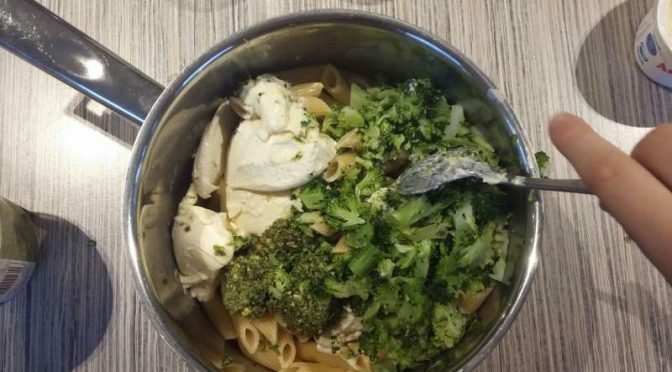 The illnesses passed and so did the obsession with pureed broccoli stalks but one of the meals I made at the time has become a family favourite or it might be more accurate to say its become an every day ( sometimes every meal staple for my son ). It’s super easy to make, can be made in bulk and stored in the fridge and you can add different ingredients although my son just sticks with this basic recipe for breakfast, lunch and dinner. I add the broccoli cut into flowerets into the pot when the pasta has 4 minutes left to cook. When pasta and broccoli is cooked I remove the broccoli from the pot and cut into smaller pieces so it almost disappears into the pesto. Of course you could leave as smaller flowerets. Add cream cheese and pesto (if using). At this point you can customise each person’s pasta if you so desire. E.g.I add chorizo to the adults.